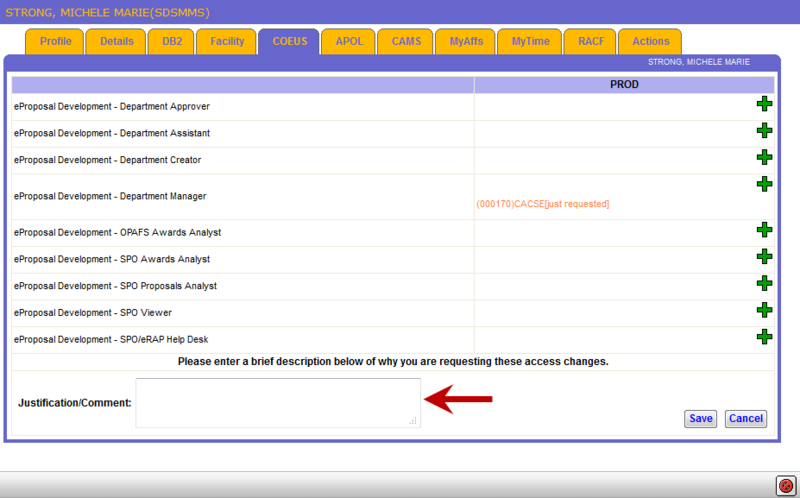 Learn how to request access to EPD, how to assign roles through AccessLink (ALTNG), and how to add other users. Step 1: Request Access to the Online EPD Training. Email the Help Desk at eraphelp@ucsd.edu or call us at 858-534-9979. Step 2: Complete the Online EPD Training (UC Learning Center). The online training is self-paced, and contains two parts. There are different roles for Departments and Sponsored Project Offices (SPO). See defined roles below. EPD (Coeus) access is managed through UC San Diego's AccessLink system (ALTNG). DSAs need to use ALTNG to grant EPD system access and must review and approve all access requests for departmental users. Provide the role(s) identified in Step 3. Include a short justification for your request (255 characters or less). Use the DSA Lookup Tool to find your department's assigned DSA. Each department at UC San Diego has one or more Department Security Administrators (DSA) who have been designated by the department Chair/Director to manage all system access requests by department users. Roles are grouped into two categories, Departmental roles and Sponsored Project Office (SPO) roles. Within each category, a user may be assigned multiple roles. 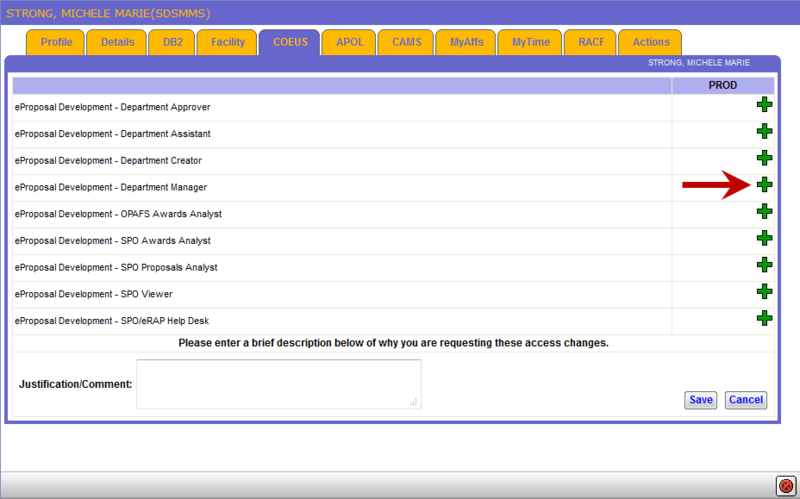 eProposal Development - Department Approver: This role grants read-only access in EPD to proposals within a department. It is intended for Department Chairs, MSOs, and other people who need to review proposals but do not need to edit them. A user may be granted this role in more than one department. For example, an MSO who is in charge of multiple departments would be given this role by the DSAs in each of those departments. eProposal Development - Department Manager: This role grants create and edit access in EPD to proposals within a department. It is intended for proposal managers and fund managers who assist in preparing proposals for multiple PIs in their department. eProposal Development - Department Creator (for Principal Investigators or other users who create their own proposals): This role grants access to create new proposals in EPD. The user can only edit proposals they have created or have been named on. Note: If a Principal Investigator does not create their own proposals, they do not need to be assigned a role via AccessLink. The default access in Coeus will allow the PI to view and edit proposals they are named on. eProposal Development - Department Assistant: This role grants view and edit access in EPD to proposals within a department. Department Assistants can also take ownership or reassign ownership of any proposal in the department. This role is intended for a user who needs to monitor the progress of all proposals within the department. eProposal Development - OPAFS Awards Analyst: This role grants read-only access to all records in the EPD and Institute Proposal modules, and edit access to all records in the Award module. It is intended for people with duties in OPAFS. eProposal Development - SPO Awards Analyst: This role grants edit access to all records in the EPD, Institute Proposal, and Award modules. It is intended for people with duties in a sponsored projects office. eProposal Development - SPO Proposals Analyst: This role grants read-only access to all records in the Award module, and edit access to all records in the EPD and Institute Proposal modules. It is intended for people with duties in a sponsored projects office. eProposal Development - SPO Viewer: This role grants read-only access to all records in the EPD, Institute Proposal, and Award modules. It is intended for people with duties in a central office, which requires access to records in all departments. eProposal Development - SPO/ERAP Help Desk: This role grants read-only access to all records in the EPD, Institute Proposal, and Award modules, and some additional access such as editing rolodex entries and releasing record locks. It is intended for people with help desk duties. Contact the relevant SPO and justify the need for this access role. The SPO personnel will present the request to the ERAP Operations Committee for approval. Once the ERAP Operations Committee approves the request, the SPO will inform you to work with your DSA to request this role. The Coeus system is tool for pre- and post-award management. EPD is a module within Coeus which manages proposal creation and electronic routing, certifications, and approvals. EPD is used by departments and by central offices. Two additional Coeus modules, Institute Proposal and Award, are being used by central offices. There are two versions of Coeus: Lite, which is web-based, and Premium, which requires Java to be installed on the user’s computer. Both versions use the same access provisioning in ALTNG. Click on the plus (+) sign next to the role. 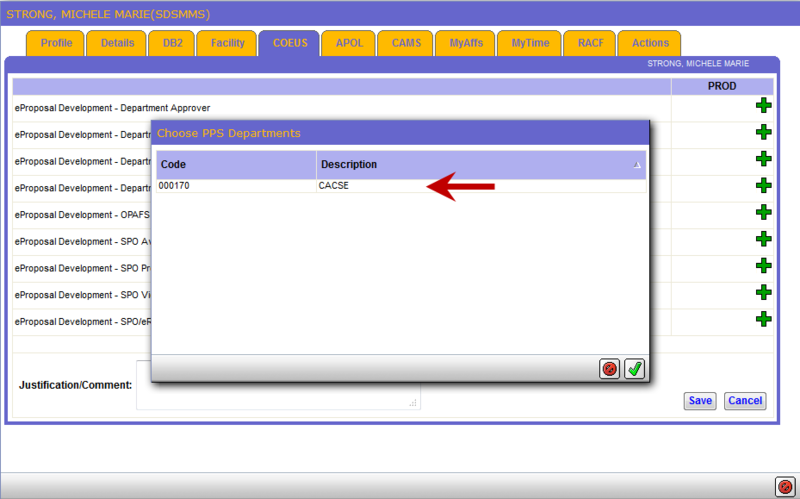 Choose the user’s PPS department in which the role should be assigned. Click the check (a) button. Enter the following justification message: Requesting access to eProposal Development – “Role Name (selected in Step 1 above)” role for the “Department Name & Department Code.” For e.g. Requesting access to eProposal Development – Department Manager role for the San Diego Supercomputer Center 000170. Contact the Department Security Administrator (DSA) in the unit that will be sponsoring the individual (e.g. the home unit where the new PI will be employed), and ask them to create a department sponsored affiliate account. 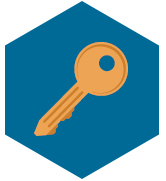 Provide the DSA with the information they will need to complete the ITS Data Steward Authorization Form Request (PDF) in step 2. Creates an affiliate account for the individual using UCSD’s MyAffiliates application: https://myaffiliates.ucsd.edu. Completes the Data Steward Authorization Form Request (PDF) and obtains all required departmental signatures. Emails a copy of the completed form to the ITS Identity and Access Management Team. Reviews and approves the form. Promotes the affiliate account to a department sponsored affiliate account. Informs the sponsoring DSA when account creation is complete. Asks them to log in using their new affiliate account User ID and password. Asks the user to confirm that they were able to successfully log in. Informs the requesting department that the individual has successfully accessed MyTravel. Once all these steps have been completed, the individual should appear in EPD/Coeus after 48 to 72 hours and can then be added to any Coeus record (e.g. Investigator tab in the EPD system). The sponsoring department can then grant additional Coeus roles to the user through ALTNG system described above if needed. If you should have any questions about this process or experience any issues, please contact the ITS Identity and Access Management Team.